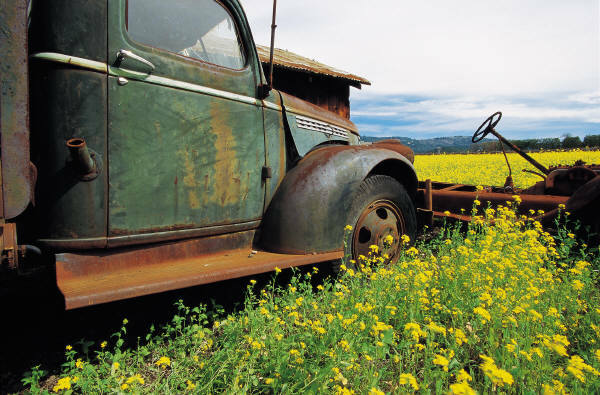 No, this isn't our truck, but it represents us: Rusty and out of gas. It's cold and raining intermittently, so we decided to abandon the workshop project today and run to the home improvement store. We need to buy a few things like new tin snips, drill bits, a few more 2X4's, insulated underwear and ear-muffs! "Looks like you've got a your work cut out for you," the gal at the check-out in Lowe's kidded as she winked at me. "You have noooo idea," my honey sighed as he grimaced just using his arm muscles to write the check. Out of the corner of my eye, I saw the two men behind my honey look at me and then just shake their heads in sympathy. "How 'bout a big ol' steak at Applebee's?" I asked my honey fairly loudly. "Sure! I'll go get the car," he smiled broadly. As we left I looked back at the men in line. They gave me thumbs-up. Yeah. Will work for food. Day three rained like cRaZy, so we're into day four. My honey's wearing a hat and fleece-lined hoody because it's almost thirty degrees cooler than normal. My job: Pull twisted string across floor to keep the rock level. Check. Use extra blocks we already had and a few purchased ones to shore up the base rock floor. Check. My 2nd job: Mush Down. It was my "job" to walk on the chat...er, base rock and "mush it down" because when compacted, it provides a concrete-like base. *light bulb moment* That's how base rock is different than chat. Go on diet because "I'm so HEAVY I can mush baserock flat!!!" I said for the benefit of the pewter squirrels, who I suspected were measuring my backside with their little clawed hands. Tired, cold and feeling fat. Check, check and check. Those darling, little pewter squirrels can be purchased at Pottery Barn. I included them because they're cute and looked like they're praying for better weather...or praying for me not to mush them! It's slow work. It's a challenge on the back, knees, arms and shoulders. Why? Well, part of the reason is we're not in our 20's, 30's or even 40's. (Did I just admit that?) And secondly, it was done one shovel load at a time by my honey. I asked to help, but still feeling badly about the migraine incident, he said he'd rather me just sit upwind and visit with him. Beside, it won't take long. And the chill in the air gives him energy. "That's a lot of cha...base rock to move, honey. Are you sure I couldn't help somehow?" I asked. "It's just one load at a time," he smiled and winked. That's one of our philosophies of Life: One load. One step. One piece. One bite at a time and it will get done and you will get through it. At the end of the lonnnggg day I fixed him a great dinner, then ran him a hot bath and brought him Advil, extra strength. Tired, cold and sore, but we "gotter done." "It looks like chat," I said. "It's BASE rock," he replied. "If you say so. It looks like chat and it looks like a LOT more than we need." Base rock. $130.00 delivered. Check. I'm going to take a short side excursion from my typical posts for a few days to share our recent experience. Here is Old Sweetwater's less-than-attractive metal carport in the bottom left corner. The half-finished well house is the short brown box in background. Anyway, the carport inspired me. Yes, inspired me. Did you shake your head in pity? So did my honey. Well, his was more of a "Lucy? What are you thin-kin?" -- as in the old I Love Lucy Show. Then it turned into a "No way!" shake, so I had to sell him on the idea. "It CAN be done," I began. "Beside honey, you'll need a workshop if we build the barn house. AND it will be a 20X18 workshop. Imagine THAT!" This photo is day 2 of our "vacation." The weather was cool but beautiful and we were ready to, as our southern friends might say, "Laissez les bons temps rouler!" Aye-eeee. Remove 6 inches of bark off the "floor." Check. No! I immediately got a migraine, I mean a full-blown ugly one. Discovery: there was about 1 inch of powdery mildew on the ground just under the bark. I'm super-allergic to mildew. I spent the day in racking pain while my sweet honey cleared and sprayed nearly a gallon of Clorox on the ground. Day three will be better. The light barn-inspired light fixture is Pottery Barn. Do not ask me why, but I like rust. I don't like it on things that I don't WANT to rust, but I like the look of it. Maybe it's the color? Maybe it's the idea that the item is not "prissy," but hard-working? My mom always shook her head when I'd head toward the "rusties." She didn't see what I saw. 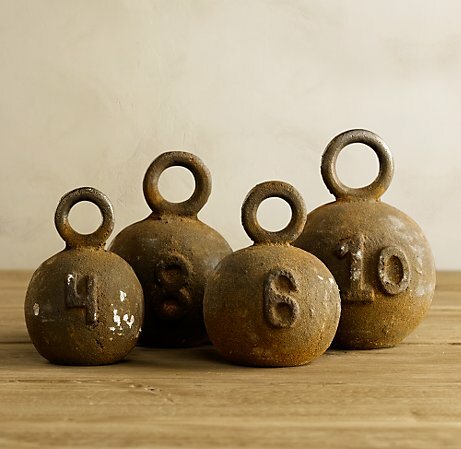 Whatever the attraction, it is all over these cast iron fishing weights for commercial fishermen. I also like the fact they have numbers on them which indicate the weight in pounds. They'd look great sitting inside or out. Time to enjoy our world. Like crisp, fresh air to breathe. I'm offering plain, sesame, Dutch apple raisin and French toast bagels this morning. 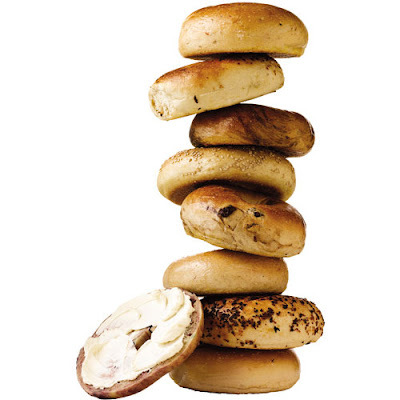 Yes, there's plenty of cream cheese. Yes, there's butter and honey. The coffee is steamy hot. The cranberry juice and milk is poured in cold, frosty stemware. This is the sunset we enjoyed at Old Sweetwater as we waited for our Workshop lumber to arrive. It was chilly so I brought out two mugs of coffee. My honey and I sat on our lawn chairs where one day, we hope to have our patio to the Barn House. It almost looks like a painting, but I assure you, it was real. Are you a sunset or sunrise person? Dean and DeLuca is a store we are fortunate to have in our metro. In my humble opinion, it's a gourmet store beyond gourmet stores. 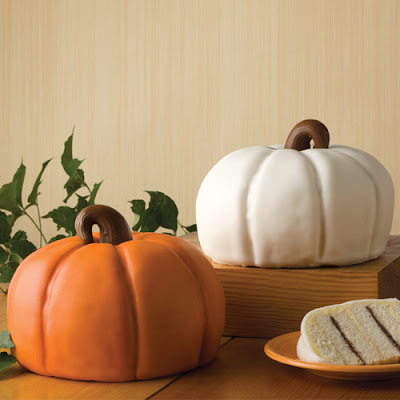 Here is their pumpkin cake. Under the white chocolate shell is six - count them - six layers of moist vanilla spice cake sandwiching praline buttercream and rich chocolate fudge. Oh my. At $120, these cakes are not for the financially challenged. However, maybe it will inspire you to make your own version...or pay a friend to make you something similar? Anyone else like D & D? Instruction manuals - I actually read them. Dislike long-term projects (3 months or longer in my opinion). I own nine sets of dishes & seven sets of flatware. I'm a visual person, so I learn and communicate better via the written word and pictures. To truly relax has always been a challenge for me. It used to be hard to say "no," but I'm getting better at it. I can get "tickled" - as in someone says or does something that makes me laugh - and then find it hard to stop giggling, especially in inappropriate events like wedding ceremonies. One of my biggest thrills is making something that was pitifully ugly, beautiful. "Useless" crafts don't appeal to me. Cowboys and farmboys make me weak in the knees, that's why I married my honey! Enough about me. What about you? BTW, I was two years old in the photo above. 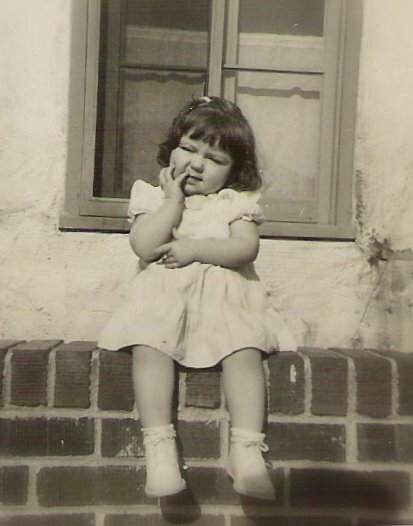 When I was about ten, I walked into my aunt's stucco and brick craftsman bungalow on Euclid Street. In her 1960's half apron, she was in the kitchen talking up a storm to my mom and other women visiting that day sitting at the kitchen table. LaRue (I know!) put some ingredients in the bowl of a large mixer standing by itself on her counter. 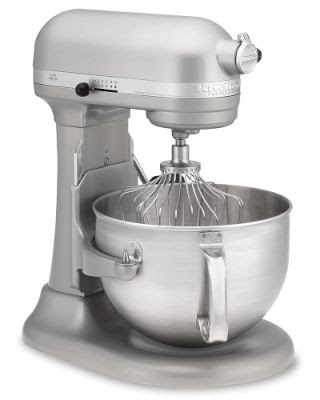 She walked away to attend something else while the mixer blended her ingredients in a gleaming stainless bowl. I was awe-struck and never stopped talking about it. Almost five years ago my honey said he'd been thinking of what to buy me for Valentines Day. He wanted to get something (that in my heart) I wanted for a long time, but couldn't justify since I don't consider myself "a cook." He surprised me by driving to Williams & Sonoma and saying, "You've talked about the KitchenAid mixer for years. Pick out the one that will make your heart happy." It the biggest one & it's heavy, but I still smile every time I look at it...and occasionally use it. lol. 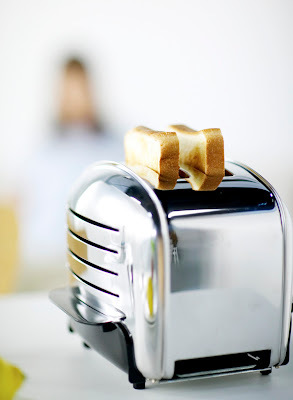 Anyone else have a KitchenAid moment? I saw Martha Stewart years ago in her garden shed (on TV). She was patiently cleaning and repairing her garden tools. Since then I've decided to enjoy the process of restoring and repairing the tools that served us well throughout the summer and early autumn. 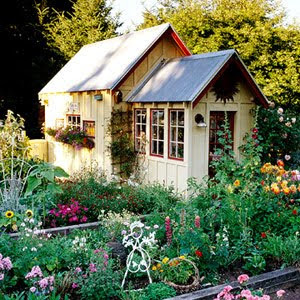 We're going to refurbish our Sweetwater Carriage House into a viable garden shed. It was built about 100 years ago for the Model T Ford (made by Henry Ford 1908-1927). It's sweet, but in dire need of repair. I'll take before and after photos and post them. 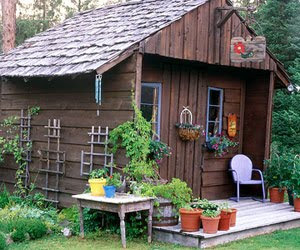 In the meantime, here are a couple of sweet sheds from BH & G.
Do you own a garden shed or have wanted to? 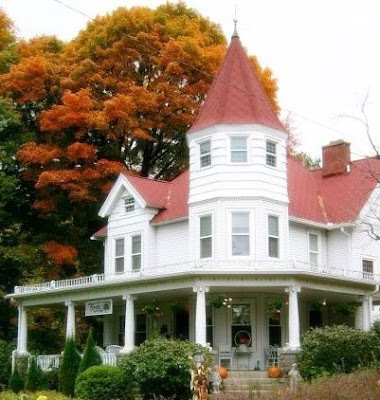 I'm no bed and breakfast like the Kingsley House pictured here. Never wanted to be. However, in my life I've had a bit of overnight company as you probably have. With holidays soon to arrive, a lot of us may be thinking about sprucing the place up in anticipation of company. One of my things to do is leave a dish of decadent candy by the guest's bed. I buy new towels, wash cloths and hand towels (white, of course) for the days they'll be staying. The bonus is we get new towels to use after company leaves. 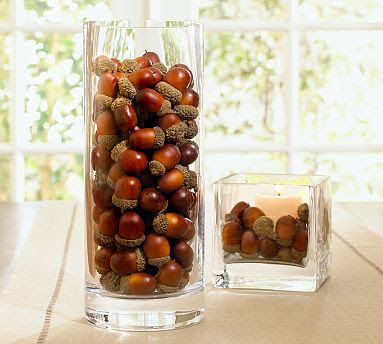 What are some special things you do to decorate or make your home cozy for guests? I have a very large copper bucket I use for wood. It's oblong and I got it for a "STEAL" at one of those stores you discover that's all junky. You know the kind where the owners don't even realize what bargains they're offering. Yay! I bought a lot of fabulous things there. Then one day we walked in and everything was getting organized. "Uh-oh," I mumbled, "this isn't looking good. It's getting too....well...cleaned up." Sure enough with cleaner, more organized merchandise, came larger price tags and less bargains. 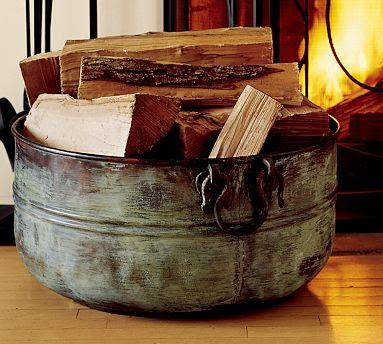 By the way, this copper beauty is at Pottery Barn. A large glass vase is the most versatile decor accessory we can have, in my humble opinion. For autumn, fill it with mixed nuts of filberts, pecans, hazelnuts, Brazil nuts and walnuts, which are abundant in the store right now. Or choose one favorite nut, as shown. Pick up colorful leaves and pine cones on your walk. Crabapples look good with a few leaves tucked in. 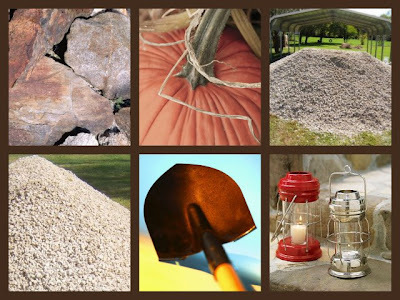 Pebbles or stones are simple, but elegant. What do you put in your clear vase? I have always liked monograms. Remember when men used to have their cuffs monogrammed? The classy guys had it done tone-on-tone so it wasn't so obvious. I like the idea of monogrammed sheets that only you see. Okay. 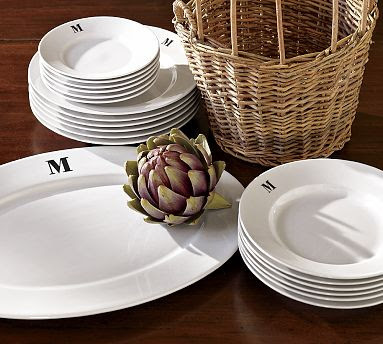 a little goes a long way -- maybe just the platter and/or salad plates. I found these at Pottery Barn. 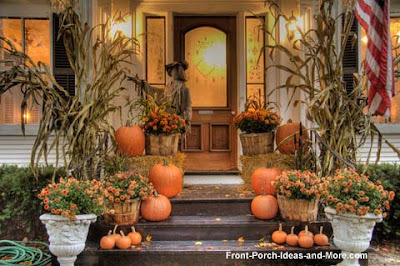 Is this the quint-essential Autumn front porch? I want to drink hot apple cider when I walk inside of this home, don't you? 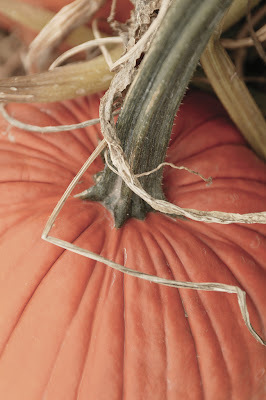 The mix of round pumpkins with square bales of hay, flanked with linear corn stalks is no mistake. Even the flag helps tell the "story" of this home. 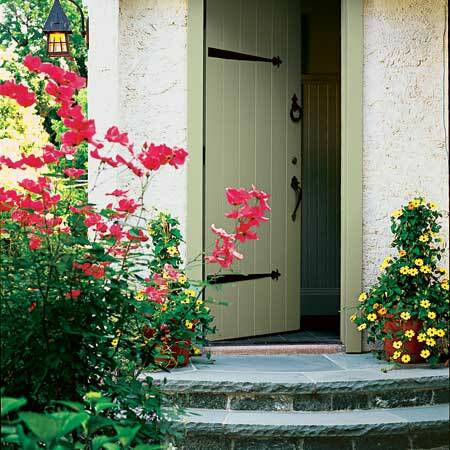 Do you decorate your porch, deck or door? 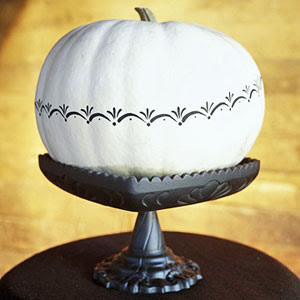 For those of us who really, really like white, here is a fresh idea from BH & G.
The stand I can take or leave, but the design they painted on the pumpkin is nice and something different. 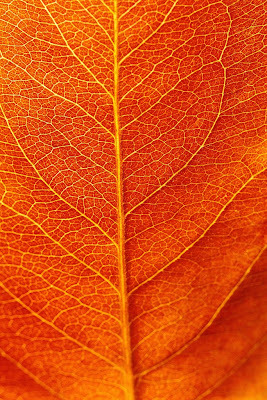 Black or brown fall leaves stamped on a white pumpkin may be pretty too. Has anyone spray painted a pumpkin? "Orange is my signature color," she said, "I LOVE it!" She was dressed in orange from head to toe. Ya know what? She looked GOOD in it. Redheads look great in orange because of their warm skin tones and eye color. Her home (I was told) also had a great deal of orange in it. Year ago I would have given her a look mixed with pity and humor, but today I think she's cute and quirky. She's who she is.I like that....more than that, I applaud that.Doncha know she's as happy as can be in autumn because her "signature color" is everywhere? Today I celebrate orange with her. Yay, orange!!!! These doors have CHARACTER, don't they? I wonder who made them. Sometimes shops will show where they got them, but these were nameless and without description. 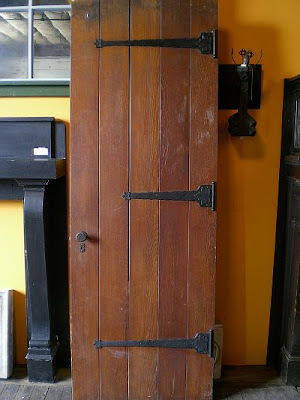 At Old Sweetwater, we have eight or ten old interior doors. All of them are over 135 years old. They need to be professionally dipped-stripped. Of course, they have lead paint. But they are solid wood. 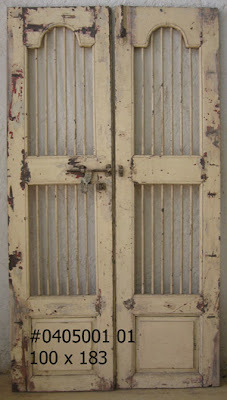 Do you like new or old doors? The table's set with the red and white transfer ware. I'll put out the flatware with the red handles. White, starched cloth napkins from a restaurant supply. Red, orange and yellow mums cut short and put in an old off-white creamer. Eggs over-easy sound good for a change. Smoked, thick-sliced bacon with peppered rind. Toast with just a little unsalted butter, topped with fresh apple butter. 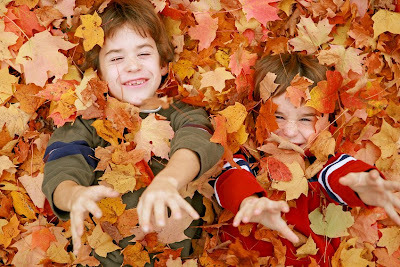 Anybody for jumping in a huge pile of leaves? 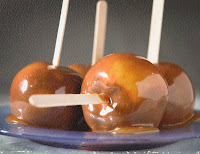 Does the rich smell of caramel comfort you? You like red-hots and cinnamon. They beautiful as well as tasty. wraps or pre-melted cinnamon concoctions). Here's a new recipe for chili. The prep time is 30 minutes. It takes 2 hours to cook. And....you MUST have dill pickle slices on it. Aw, come on and at least try the dill slices! In large stock pot over medium-high heat, crumble ground chuck & sausage and cook until browned. Drain. Mix in chili beans, spicy chili beans, diced tomatoes and tomato paste. Add the onion, celery, bell peppers, chili peppers, bacon bits and bouillon. Season with the next ten ingredients. Stir to blend. Cover and simmer on low heat for at least 2 hours. Stir occasionally. After 2 hours, taste, and adjust salt, pepper, and chili powder if necessary. The longer the chili simmers, the better. Serve or refrigerate for the next day. Well, maybe not 50 pounds. Okay five or six pounds! Our cart was full ("buggy" if you're in the south). We had yummy things like multi-color bell peppers, organic spinach, four large bags of chips. Yeah. Four LARGE bags. My other half has a weakness for them. My honey: "You have to buy two at a time. It's the way they're sold. Two-fers." My honey continues, "At the check-out they'll make me go back, so I'm just saving us time and aggravation..."
Anyway, we're heading to the check-out, when on the way we see boxes of pumpkins. We slowed down just to stare. 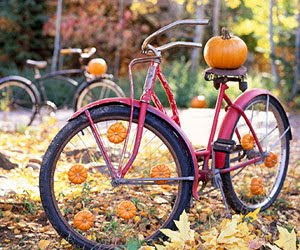 A number of people were gathering to see these splendid pumpkins. I looked at my honey and reading my mind he said, "We'd have to ask two Sam's employees to come home with us and unload that thing." Just then a young man walked up beside us to the next check-out carrying a mammoth pumpkin on his shoulder to take home. "Or...we'd have to be in our twenties again." I continued. We both smiled and winked, and paid for our chips. I really like the look of apples. There's something wholesome about them to me. Fuji apples are my favorites. They're crunchy and yet very sweet. A dear friend gave my honey and I a bag of home-grown, organic apples. 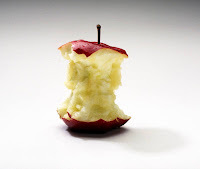 I washed one and bit into....well....a rather less-than-sweet apple. I'll say this: they're not Fuji. So, I got out the peanut butter. I schmeeeerred the gooey, golden brown spread on each bite. Am I missing something, or is there a recipe for an apple/peanut butter pie? Or is there a recipe for apple-peanut butter cookies? 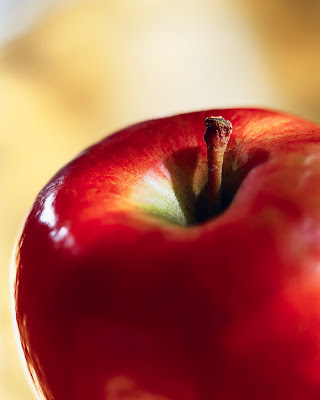 Which apple is your favorite? This is a great Autumn home to me. The color of the stucco is a bold choice, but it works. The stone wall just cries for a pumkin or two to sit at its base. Would you be willing to live in a home this color? We've been looking at doors for Old Sweetwater. Before we even begin pouring the footers or foundation for the barn home, we need somewhere to store all the stuff currently in it like two riding mowers, garden tools, boards and assorted...uh..."treasures." I got the bright idea to turn the double carport (very, very ugly now) into that place. It will double as a workshop for my honey. At least that's the plan on paper. 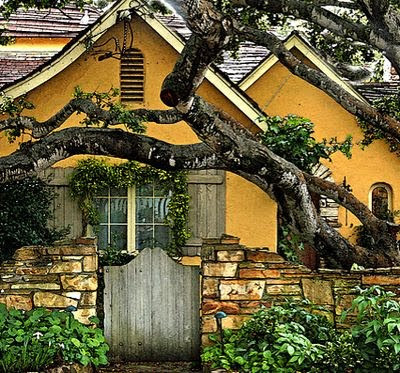 Instead of a garage door, we want doors like this one. Anyone know a site where we can learn how to build them where one door closes over the other? We don't heart center posts between doors. Last year we grew sunflowers from heirloom seeds. 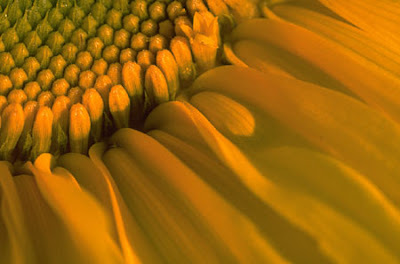 We had the idea of harvesting the sunflower seeds; roasting them & enjoying the fruit of our labor. They grew to 8 feet tall. In fact, they had to be supported with twine and stakes. They were "scary big." As summer gave way to Autumn, their huge heads drooped heavily with seeds. Every week or so we'd check. Well, that's not exactly correct. No mature seeds for US. The birds were having a feast! I guess they were eating the seeds before we got up b/c I didn't see any winged friends helping themselves or I would have made a scare crow or place tin pie pans around to scare the little "moochers!" This year we bought our sunflowers seeds & I have a greater appreciation for the farmers. Do you remember not long ago, that people would laugh at anyone with an electric - fake fireplace? "Ugh! So tacky," they'd sniff and roll their eyes. My honey and I went looking for a wood burning fireplace for the Sweetwater barn house so we'd know what size footer to have poured. We walked out of our local fireplace store in shock. The insert - similar, but not nearly as nice or large as the one pictured - was $5,000.00. Uh-huh. Five grand for just the insert (the little black part). 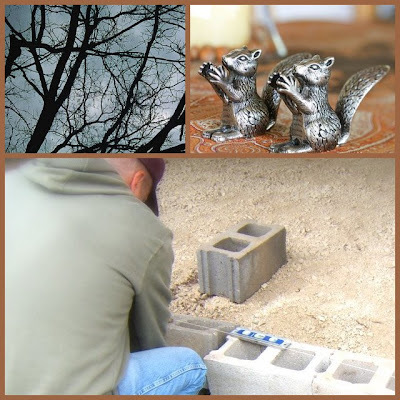 No outside cover work over the pipe, as in rock, stucco or wood. No inside work such as drywall or marble. The EPA has cracked down on emissions, so guess what? Now electric, fake fireplaces are popping up everywhere again. Those laughable electric logs? Yes, new and a sometimes improved. Anyway, today we ended up buying a nice wood-burning pre-fab fireplace. We've been pleased with the ones we've had in the past. 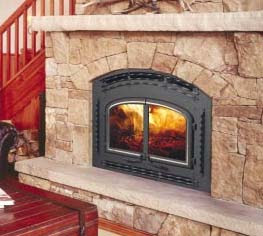 The FP, chimney kit and very nice nickel plated, thick glass doors came in under $422.00. The squirrel cage blower that moves the heat into the home is on order. It's a little over $100. That's about 1/10 the cost. All made right here in the U.S.A. too. Yay! At this price, we may end up with a fireplace in the bedroom too. Double yay! 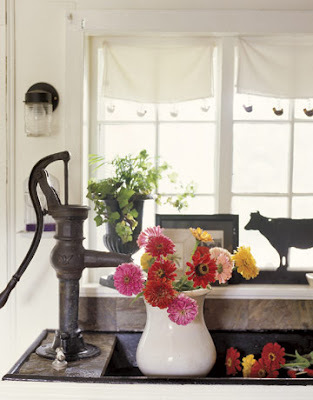 I saw this idea over at Country Living Magazine and thought it looked kind of "Farmhouse Chic." It reminded me of my grandma's house that had a red pump outside that you had to prime before water would come up from the cistern. Anyone had experiences with those? If we make the Sweetwater barn into our final home as planned, we need a semi rustic-Dutch farmhouse-Scandinavian (the white of it all)-German look. Does that sound too mixed up? Right now I'm a little stumped on outside lighting. I don't like the traditional, authentic barn lights that I see companies offer. I DO like the high-quality bulbs that flicker. I DO like wrought iron.